Ecohouse Solar recently installed a small solar electric system for a customer near Lancaster, Ohio. 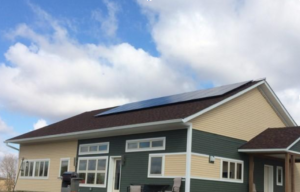 This customer had just finished building a “Passive” house and we added a solar array. The home is powered almost completely by clean solar energy. A Passive house is designed to be super energy efficient. It incorporates design concepts that were developed in Germany and include a very tight and well insulated building envelope, energy recovery ventilation, and efficient heating and cooling, lighting and appliances. This type of homes is more comfortable to live in than average, use significantly less energy, and is more durable than a typical home. It seems to me all homes and all new buildings should be like this one. The cost was no greater than an average home. And even if the cost is slightly higher, the benefits far outweigh the extra cost. Ecohouse Solar is proud to be part of this project. For us this is the ideal: energy efficient design paired with renewable energy. We would like see many more homes and buildings like this. Well, the answer is simple. Humans are warming the planet by burning fossil fuel and putting CO2 and Methane into the atmosphere. We have a serious problem that needs to be addressed as soon as possible and in a big way. We are completely supportive of any political efforts to address climate change, such as the Green New Deal. I started Ecohouse to address this problem, and I am motivated to do something about it. I have been concerned about the health of life on our dear planet earth since my childhood. It has always seemed obvious to me that the earth could not sustain the fast-growing population of humans and our destructive and polluting activities for an indefinite amount of time. It has now been more than fifty years since I first realized this. The situation is much worse today. Now there are twice as many people, and the scientific community has made it abundantly clear that humans are causing the earth to warm. In the last few years, I have traveled to China and Thailand, and was able to see firsthand the effects of a quickly growing population and weak environmental laws. In China I saw very large urban areas with little left of the green natural world, and instead saw miles and miles and miles of nothing but buildings, roads, trash, polluting vehicles, and very polluted air. In Bangkok Thailand, it was the same – millions and millions of people crowded in a city with poor waste management, and awful air pollution, in a large part due to the ubiquitous two cycle engines on the city streets, all belching out CO2 and other pollutants into the air. I have not been to India and have heard its worse there. These trips really impressed on me the great need to work on solutions to climate change. Twenty-five years ago, I joined a local group in Columbus, Ohio called Simply Living. Being a member of this group helped me to put the pieces together and to really understand the importance of sustainability. The only way that humans can continue to live on earth for the long haul, in harmony with other life on earth, is to scale back our consumption, reduce the human impact, and allow other life to flourish. Humans are not separate from other life and the earth is what sustains us. We cannot continue down the same path without dire consequences. I want to be fair to future generations and to the many beings on our planet. In the area of energy, I want reduce the amount of fossil fuel we are using and accelerate the switch to renewable energy. This is one area that I have decided make a difference, installing one rooftop solar system at a time in Columbus, Ohio.